can I please have the recipe? My man is more of a choc-o-holic than most women and we know how us women need chocolate 2 weeks out of every month. Now if only men could figure that out, so many more relationships would last whole lifetimes. Just found your lovely blog! Mmmm, yummy! Where is the recipe for this divine pie? what happened to the recipe for this cake ?? I stumbled into this blog a few years ago and have been hoping ever since that maybe you’ll let us all in on how to make this one, but my dreams have been in vain. 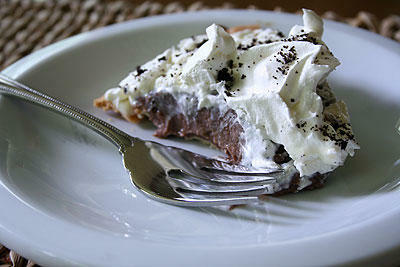 Chocolate pie is one of my favorites, but I haven’t really found my own recipe that measures up. I’ve made a bunch of your other desserts and they’re all EXCEPTIONAL, so I feel like this might be the perfect concoction I’ve been waiting for? Can you please post the recipe?